Sich societies («Січ»). Associations that began with a mass physical-education and fire-fighting organization that was active in Galicia from 1900 to 1930 and then spread to Bukovyna, Transcarpathia, and Ukrainian communities abroad. Beyond its immediate practical purpose, it strove to promote national consciousness and to raise the educational and cultural level of the peasantry and working class. Organized by leading members of the Ukrainian Radical party, its ideology was secular and somewhat anticlerical. The first Sich society was founded by Kyrylo Trylovsky in Zavallia, Sniatyn county, in May 1900. In the next few years similar societies arose in Kolomyia and Horodenka counties, and then in other counties of Galicia and Bukovyna. Local village and town societies were grouped first into county organizations. A central association for all of Galicia was formed in Stanyslaviv in 1908. Its head office was located in Kolomyia. The chief executive body, the Supreme Sich Committee, consisted of Trylovsky (president), Ivan Sanduliak (vice-president), I. Chuprei (secretary), and Mykola Lahodynsky (treasurer). In 1912 it was renamed the Ukrainian Sich Union (USU), and its office was moved to Lviv. USU executive members were Trylovsky (general otaman), Yaroslav Vesolovsky (general osaul), M. Balytsky (secretary), S. Vynnykiv (general treasurer), Dmytro Katamai (general quartermaster), and F. Kalynovych (general chetar). In addition to those already named, the key organizers were A. Kuzmych, Yu. Solomiichuk-Yuzenchuk, Petro Shekeryk-Donykiv, Andrii Chaikovsky, Roman Stavnychy, Lev Lepky, Roman Dashkevych, H. Nychka, Volodymyr Hurkevych, Volodymyr Lysy, V. Bemko, Dmytro Vitovsky, Stepan Ripetsky, Mykola Uhryn-Bezhrishny, O. Demchuk, M. Khrobak, and O. Semeniuk. The number of local societies increased steadily; by 1913 there were over 900 branches, with a combined membership of 80,000. Sich members wore the local folk costume, a crimson sash over the shoulder inscribed with the wearer's place-name, and a hat decorated with a red feather and a star-shaped badge. From 1910 a special uniform was worn by members of urban and some rural branches. Each member carried a long-handled wooden Hutsul ax. Village and county branches had their own flags. The Sich societies held annual county and, later, province-wide congresses. Their program included a parade, choreographed exercises, and a concert. The first congress was held in Kolomyia in 1902. Larger ones took place in Stanyslaviv in 1911 and Sniatyn in 1912. The largest, known as the Shevchenko assembly, was held in June 1914 in Lviv. Approx 12,000 members of the Sich, Sokil, and Ukrainian Sich Riflemen's societies, the Plast Ukrainian Youth Association, and sports clubs took part, and Czech, Croatian, and Slovenian Sokol and other physical-education organizations sent observers. After Kyrylo Trylovsky founded the Ukrainian Sich Riflemen (USS) society in March 1913, a riflemen's section, chaired by Dmytro Katamai, was set up in the Ukrainian Sich Union (USU) to train young men in the military arts. Eventually the section broke away from the USU and formed separate Sich Riflemen's units (96 in 1914). Their field exercises were conducted according to O. Demchuk and O. Semeniuk's infantryman's manual (1914). 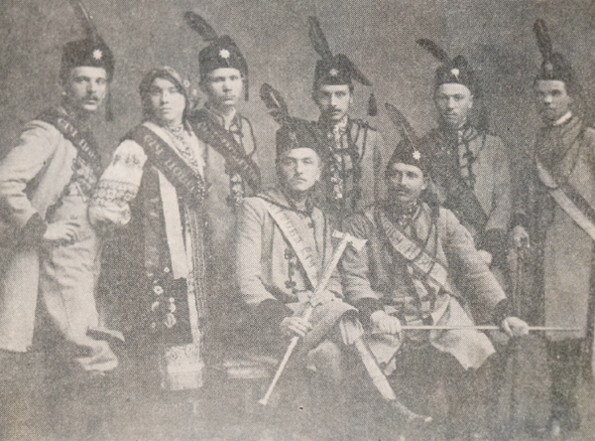 In August 1914 the Legion of Ukrainian Sich Riflemen within the Austrian army was formed out of volunteers belonging to the USS, USU, and Sokil societies. To popularize and promote the Sich movement, Kyrylo Trylovsky and I. Chuprei edited and published songbooks; annual almanacs (11 by 1914); magazines, such as the monthly Zoria (Kolomyia) (1902–3) and the biweekly Khlops’ka pravda (1903, 1909) in Kolomyia; and the official Sich organ Sichovi visty (Lviv) (1912–14, 1922–4) in Lviv. After the First World War, the Sich societies resumed their activities in many localities of Galicia, until the Polish authorities prohibited them, in 1924 (the last local society, in Horbachi near Lviv, was closed down in 1930). Their restricted physical-education and sports program was continued by branches of the Luh society. In Bukovyna the first Sich society was founded in 1903 in Kitsman by Sylvester Yarychevsky and O. Popovych. The central body, the Union of Siches, was set up in 1904 in Chernivtsi. The presidents were Yerotei Pihuliak, Teodot Halip, and R. Siretsky; other leading members were Ilko Popovych, H. Hordy, Yurii Lysan, Lev Yasinchuk, and D. Rusnak. A pan-Bukovynian Sich assembly took place in Chernivtsi in 1912. By then there were 112 local branches, with a combined membership of 9,000. Under the interwar Romanian occupation the societies were banned. In Russian-ruled Ukraine, community leaders followed the development of the Sich movement in Galicia with great interest, but were not permitted to set up similar societies. After the Revolution of 1917 they established a Sich society in Kyiv, and its statute was approved in 1918 by the Ukrainian government. In February 1919 Kyrylo Trylovsky and O. Andriievsky organized the Supreme Sich Committee in Vinnytsia, and in October 1919 Petro Shekeryk-Donykiv and Andrii Shmigelsky formed a Sich society in Kamianets-Podilskyi. Its membership grew to 300, but the Soviet occupation of Podilia ended all efforts to build a Sich network in the region. In Transcarpathia a Sich Committee was formed in 1920 in Uzhhorod at the initiative of Kyrylo Trylovsky. That year, D. and V. Klempush founded the first Transcarpathian Sich society in Yasinia. In 1938–9 the Carpathian Sich grew out of the Transcarpathian Sich movement. In the United States and Canada, the Sich movement began with the founding of the physical education and rifle society of the First Branch of the Ukrainian Sich Riflemen in New York in July 1915. A central organization, the Sitch Ukrainian American Athletic Association, was set up in November 1916 under the leadership of Petro Zadoretsky. By 1920 it had approximately 60 branches and over 3,000 members. Besides physical education, the association was involved in various sports and in paramilitary training. It ran a commercial firm called the Sitch Bazaar, which included a publishing house and bookstore, and published physical education manuals and the magazine Sichovi visty (United States) (1918–24). In 1924–5, as the Ukrainian community became politically more differentiated, some Sich societies joined the hetmanite Sitch organization, others formed the Chornomorska Sich athletic society, and the rest remained independent organizations. In Canada the Sitch Organization was founded in 1924. In 1927 it had 21 branches, and in 1928 it was renamed the Canadian Sitch Association. At first it was connected with the Sitch Ukrainian American Athletic Association, and in 1934 it became part of the United Hetman Organization, with 50 branches in Ontario and the prairie provinces. In Western Europe the first Sich society was organized in 1912 by Ukrainian workers in Hamburg. In 1921 in Vienna, Kyrylo Trylovsky set up a workers' physical education society, which eventually evolved into the External Committee of Siches, consisting of former members of the Sich societies in Galicia. Emigrés in Czechoslovakia founded Sich societies in Poděbrady (1926), Prague (1927), and other cities. In 1927 they held their first congress and formed the Ukrainian Sich Union. Its members belonged to local workers' gymnastics clubs and took part in international workers' olympiads in Prague in 1927 and 1934 and in Vienna in 1931. The leaders of the union were Vsevolod Petriv, I. Sokalsky (1933–8), and Yosyp Bezpalko. A referral to this page is found in 22 entries.